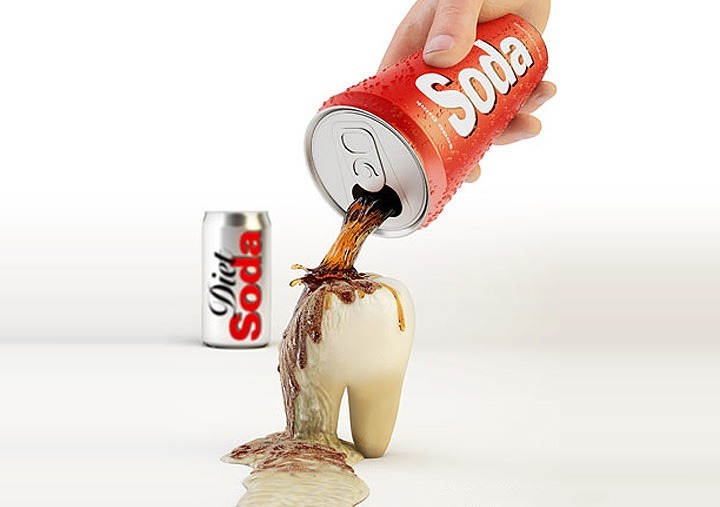 HomeBlogWhat Does Soda Do to Your Teeth? When you drink soda, the sugars within interact with bacteria in your mouth to form acid. This acid attacks your teeth. Both regular and sugar-free sodas also contain their own acids, and these attack the teeth too. There are two main dental effects of drinking soda: Erosion and Cavities. Erosion begins when the acids in soft drinks encounter the tooth enamel, which is the outermost protective layer on your teeth. Their effect is to reduce the surface hardness of the enamel. Soft drinks, on the other hand, can also affect the next layer, dentin, and even composite fillings. This damage to your tooth enamel can invite cavities. Cavities, or caries, develop over time in people who drink soft drinks regularly. When combined with poor oral hygiene, the results can be disastrous. Unfortunately, children are most at risk for suffering the teeth-damaging effects of soft drinks, as their vulnerable enamel is not fully developed. The obvious solution is to stop drinking soda. Unfortunately, many of us just can’t seem to kick the habit. Fortunately, there are things you can do to lessen the risk of damaging your teeth. Drink in moderation. Don’t have more than one soft drink each day. Just one will do damage enough. Drink quickly. The longer it takes to drink a soft drink, the more time it has to wreak havoc on your dental health. The faster you drink, the less time the sugars and acids have to damage your teeth. Use a straw. Using a straw to drink soda will help keep the damaging acids and sugars away from your teeth. Rinse your mouth with water after drinking a soda. Flushing your mouth with some water will help wash away any remaining sugars and acids, and stop them from attacking your teeth. Wait before you brush. Despite what you may think, brushing immediately after you have a soda is not a good idea. That’s because the friction against the vulnerable and recently acid-attacked teeth can do more harm than good. Instead, wait 30 to 60 minutes. Avoid soft drinks before bedtime. Not only will the sugar likely keep you up, but also the sugar and acid will have all night to attack your teeth. Get Your Regular Dental Cleaning in Dubai at Dr. Joy Dental Cleaning. Regular checkup and examination will identify problems before they get worse.